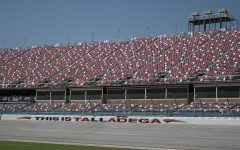 In the first NASCAR Camping World Truck Series practice at Talladega Superspeedway, Justin Haley, driver of the Fraternal Order of Eagles No. 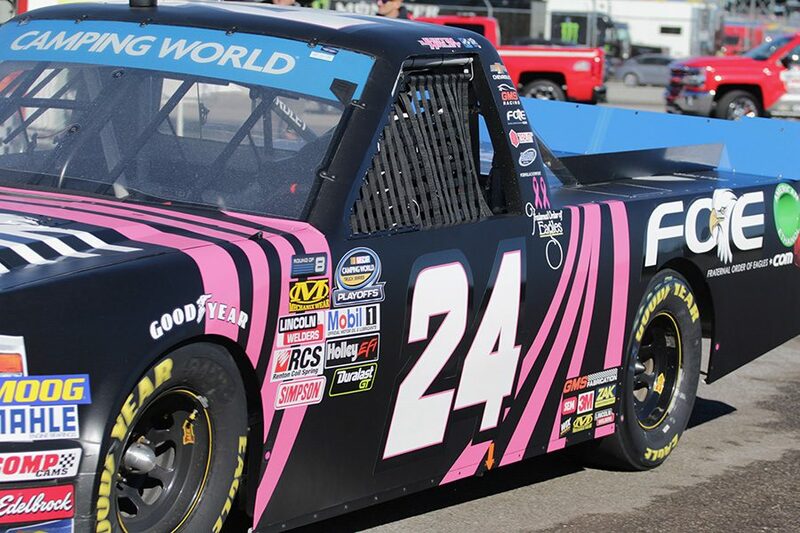 24 Chevrolet Silverado for GMS Racing, paced the field with a top speed of 193.49 mph. Overall, Chevrolets dominated, claiming the top five speeds in the morning session. 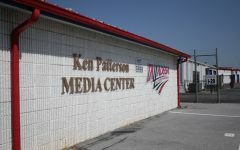 After a month-long break from racing, NASCAR Camping World Truck Series drivers returned to the track for the first practice session ahead of the Fr8Auctions 250 at Talladega Superspeedway. As the trucks hit the track for the first time, Justin Haley, driver of the Fraternal Order of Eagles No. 24 Chevrolet Silverado for GMS Racing, paced the first practice session with a best time of 49.490 seconds and a top speed of 193.49 mph. 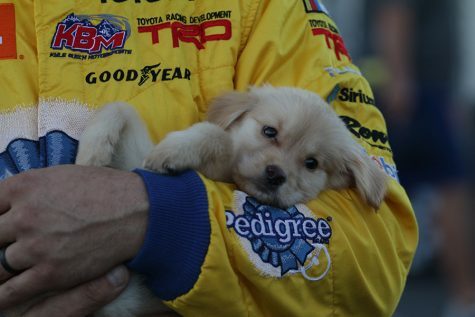 “The first round was really good to us, fast in the draft, fast single car run,” Haley said. Finishing 0.002 seconds behind Haley, Spencer Gallagher, driver of the Allegiant No. 2 Chevrolet Silverado, came in second with a top speed of 193.486 mph and best time of 49.492 seconds. 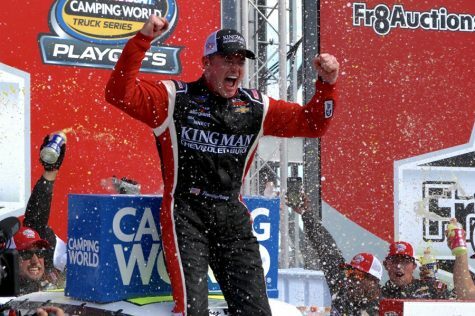 Last year’s winner of the race, Parker Kligerman, driver of the No. 75 Food Country USA Chevrolet Silverado for Team Henderson Motorsports, finished the morning session in third place with a top speed of 192.355 mph and a best time of 49.783 seconds. 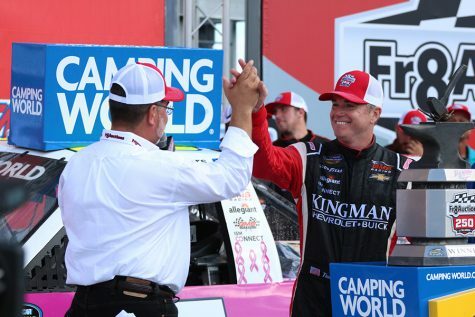 Finishing fourth was John Hunter Nemechek, driver of the No. 8 Fleetwing Corporation NEMCO Motorsports Chevrolet Silverado, with a top speed 192.027 mph with a best time 49.868 seconds. 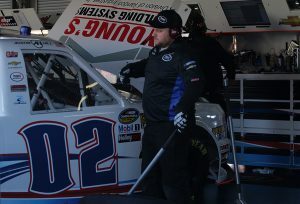 Johnny Sauter, driver of the No. 21 Allegiant Chevrolet Silverado also for GMS Racing, rounded out the top five with a top speed of 190.947 mph and a best time of 50.15 seconds. Going into the practice, the expectation was that the drivers would run single file, but toward the end of the session pack runs were more frequent. 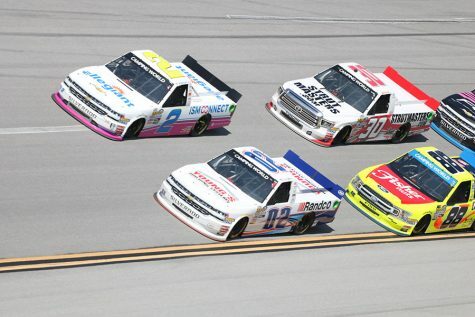 Chevrolet was dominate through the first session with all top five drivers in Silverados. Georgia native Austin Hill, driver of the No. 02 Young’s Building Systems/Randco Chevrolet, placed 24th in the first practice session. Fellow Georgia driver Korbin Forrister, operator of the No. 7 TruClear Toyota for All Out Motorsports, came in 18th. 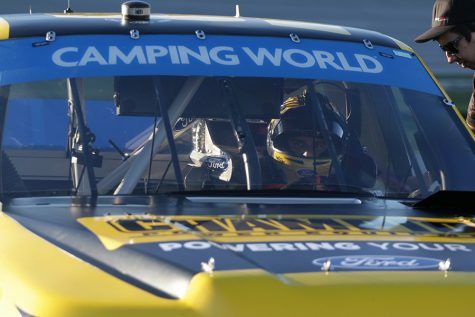 The winner of the last race at Las Vegas Motor Speedway, Grant Enfinger, driver of the No. 98 Champion Power Equipment/Curb Records Ford F-150 for ThorSport Racing, struggled in the first session after experiencing a vibration and finished 16th with a top speed of 185.090 mph and best time of 51.737 seconds. Korbin Forrister, operator of the No. 7 TruClear Toyota for All Out Motorsports, scored the best finish of the Georgia drivers with a top speed of 184.239 mph and best time of 51.976 seconds, good enough for 18th. Fellow Georgia driver Austin Hill, pilot of the No. 02 Young’s Building Systems/Randco Chevrolet, finished 24th with a top speed of 178.6 mph and time of 53.617 seconds. Hephzibah, Georgia, native Wendell Chavous did not make a run in this session along with one other driver. 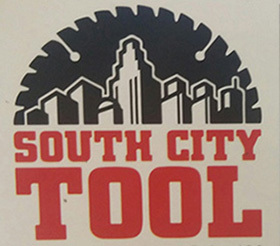 The trucks will run their final practice session today at 10:30 a.m. CDT and qualify tonight at 4:30 p.m. CDT before competing in the race tomorrow.